“Stark, raving sane.” This phrase (uttered by “The Player” in Act 2) is an apt descriptor of Fells Point Corner Theatre’s current production of Tom Stoppard’s most acclaimed work: an absurdist, existential tragicomedy which, is at once an homage to Shakespeare, an inventive glimpse into an imagined alternative universe off-stage of any production of “Hamlet,” and a compelling treatise on life and death. 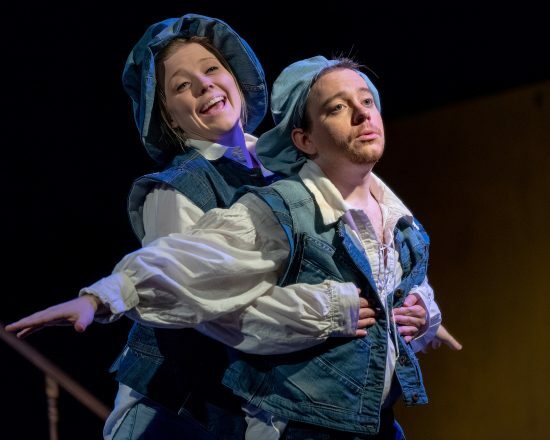 Fells Point Corner Theatre’s ‘Rosencrantz and Guildenstern Are Dead’ is well worth the price of admission and more. The play revolves around Rosencrantz and Guildenstern, two minor characters from “Hamlet,” who trade barbs and beliefs, play word games, and otherwise cavort “in the wings” of an ongoing production of Shakespeare’s tragedy. (The play’s title is an actual line from Act V, Scene II of “Hamlet” spoken by an emissary from England who curtly reports the news.) Their antics are occasionally interrupted by the more central players from “Hamlet,” who act out bits of their original dialogue as well as interact more spontaneously with the pair. Rosencrantz and Guildenstern, who seem to be unaware of their own roles in the piece (as well as constantly forgetting who is who), struggle to find meaning and to maintain control of their destinies as the action unfolds. Set Designer Gaya Sel’s sole set piece is a “skull-centric,” bi-level platform in and from which characters can hide and emerge easily. The effect is simultaneously ridiculous and somewhat eerie. The addition of two bottomless treasure chests near the end of the production is an uncomplicated and effective way to transform the set into the ship carrying the pair and Prince Hamlet from Denmark to England. Costume Designers Deana Fisher Brill and Maggie Flanigan dressed every character in various forms and shades of denim, which lent a visual simplicity and consistency while at the same time giving each character a unique look. (“The Player’s” respective pant legs, for example, were two different hues of denim, conveying an appropriate “troubadour” effect.) Sound Designer Justin Lawson Isett contributed several nuggets which really set the tone, from the aptly silly and well-crafted pre-show announcement (apologies to other unknown production members who likely had a hand in this) to the off-kilter cover versions of 70s classics such as “Paint It Black” and “Smoke On The Water” as well as to the realistic ship sound effects which are heard later in the production. Without exception, the acting ranged from very good to exceptional (more on that later), but it was apparent to this writer that Director Lance Bankerd was the driving force behind the overall and specific performances. This particular work of Stoppard’s demands not just basic blocking but a rather complex choreography, and Bankerd guides his players in this regard with a deft hand. Each movement by the actors seemed fine-tuned and painstakingly choreographed, particularly those of Rosencrantz and Guildenstern, some of whose movements seemed downright synchronized. While Stoppard’s fast-paced dialogue, awash in puns, malapropisms, and word salads constitute the meat of the play, it just wouldn’t work without the kind of intricate dance among the actors which Bankerd supplies and nimbly balances throughout the production. All of the supporting players skillfully provided the anchoring context within which Rosencrantz and Guildenstern’s could frolic and gambol. Notable among them were Kay-Megan Washington (Gertrude), whose regal diction and posture made quite clear she was the Queen of the kingdom. Tom Piccin (Claudius) convincingly portrayed a subtle world-weariness behind the ruthless exterior of the usurping King. Dominic Gladden (Hamlet) brought a raw physicality and emotional range to his portrait of the conflicted Prince. Rory Kennison was fascinating to watch as the androgynous, child-like Alfred the Tragedian, complete with juice box in hand in his first exit. But the scene stealer among the supporting players was Bethany Mayo as The Player. She imbued her character with such wide-ranging movements, intonations, accents, and emotions such that her soliloquies struck this writer as almost musical in nature. Logan Davidson as Rosencrantz (or is it Guildenstern?) played the character with a dizzy but well-controlled presence, which was a delight to watch. Davidson’s performance was particularly dazzling in Act 2, in which Stoppard provides the actor playing this character with much more fodder to display a wider range and a more nuanced execution of the role. But the highlight of the production for this writer was Matt Wetzel as Guildenstern (or is it Rosencrantz?). It is hardly common to witness such a complete absence of self-consciousness on stage by an actor, and Wetzel’s ability to do so helped him transcend Stoppard’s material to give a virtuoso performance which mesmerized the audience. As with Gladden, both Davidson and Wetzel also instilled their performances, separately and together, with a vibrant physicality which the audience clearly appreciated and enjoyed. Running Time: 2 hours and 30 minutes, including a 15 minute intermission. Dr. Dignam is a local community theatre actor who has appeared in several Baltimore/DC area productions in recent years since retiring from federal service in 2015.